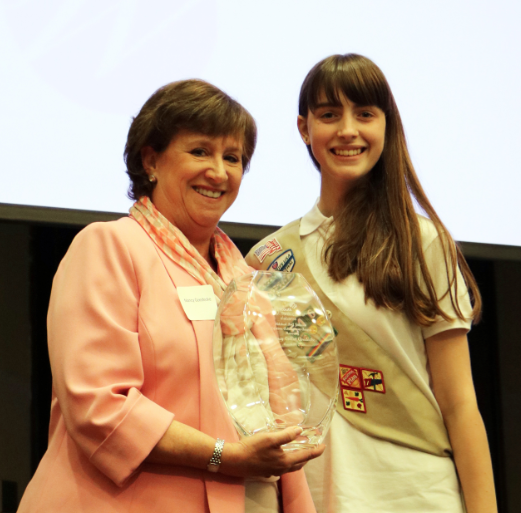 Girl Scouts of North-Central Alabama (GSNCA) is now accepting nominations for the Central Alabama Women of Distinction Awards. The 2017 Women of Distinction will be recognized at the annual Women of Distinction Luncheon at the Harbert Center in Birmingham on Thursday, March 9, 2017, from 11:30 – 1 p.m. Lifetime Achievement Award in 2016. Proceeds from the 2017 Central Alabama Women of Distinction Luncheon proceeds provides membership scholarships to girls served through the council’s outreach program in west, central and east Alabama, where underserved and low-income girls without access to transportation are provided the same Girl Scout Leadership Experience (GSLE) as girls in traditional troops. “Our goal is to provide girls in our outreach program with the leadership skills that will help them break the negative cycles in which they find themselves,” said Karen Peterlin, chief executive officer of Girl Scouts of North-Central Alabama. Through the GSLE, girls can collaborate with mentors from the science and technology fields; build positive relationships through anti-bullying curriculum; develop financial literacy skills through the Girl Scout Cookie Program; and earn their Girl Scout Gold Award by developing a service project that has a positive impact on their community for at least three years. Summer camp scholarships also give girls in outreach programs the opportunity to build confidence for themselves as they spend a life-changing summer in nature. “There’s no better way to support a program that builds girls into leaders than by showing what a female leader looks like,” Peterlin said. GSNCA will present awards for the following categories: Woman of Distinction, Young Woman of Distinction, Veteran of Distinction and three regional lifetime achievement awards. Each of the regional awards honors the memory of a beloved community leader whose contributions had far-reaching impact. The Mildred Bell Johnson Lifetime of Courage Award is given to one woman from Walker, Blount, Jefferson, Shelby, Chilton or St. Clair County in Central Alabama. The Frances E. Couch Lifetime of Confidence Award will be presented to one recipient from Etowah, Talladega, Calhoun, Cleburne, Cherokee, Clay or Randolph counties in East Alabama. The Karen LaMoreaux Bryan Lifetime of Character Award is open to women in West Alabama from Bibb, Fayette, Greene, Hale, Marion, Lamar, Marengo, Perry, Pickens, Sumter or Tuscaloosa counties.